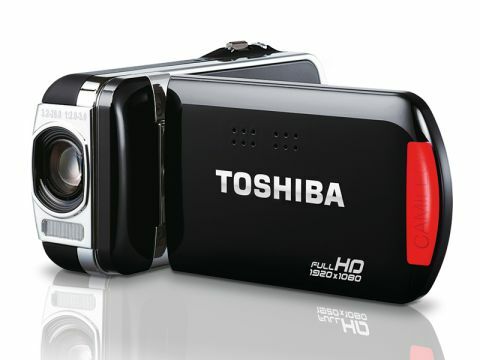 Although the Toshiba Camileo SX900 looks like a regular camcorder and has a perfectly decent specification, it feels more like a toy than a serious piece of consumer electronics. It's rather small and the casing uses a lot of shiny black plastic and chrome. Small gadgets can be very cool, but in this case the design seems to be flawed somewhat, as the hand strap and lens cap look like an afterthought. This wouldn't generally be considered a terrible sin, but we're talking about a £250 purchase. Furthermore, the tiny size of the SX900 means that you effectively need to hold the camcorder between finger and thumb as the strap isn't much help. This becomes even more of an issue when you're making changes in the set-up menu as the fold-out 2.7-inch screen sits at 90 degrees to the navigation pad on the side of the camcorder. Another aggravation was the USB connection. We plugged in the proprietary USB cable, pressed the transfer button and then had to answer the question of whether the USB connection was for a printer or a PC, and then whether the connection was for YouTube, Card Reader or MTP. The Toshiba doesn't have any built-in memory, so the best move is to simply plug your SD/SDHC/SDXC card into a card reader and forget about the Toshiba USB connection. The white LED shooting light is pointless, unless you are looking for some lost car keys in a darkened room. Toshiba has included a mini HDMI cable and an AV cable with RCA audio and Composite video connections, as well as ArcSoft and MAGIX Video Deluxe software. Overall, there's a long list of relatively minor complaints that we had hoped to counter with talk of high-quality 1080p video and 9x optical zoom. Instead we were disappointed to find that the Toshiba has similar performance to the much cheaper Kodak Zi8 and the quality of the video fails to live up to expectations.